I had quite the ride yesterday, finally tackling one of the last big mountain passes in Kyoto, Momoi Pass (百井峠) from the east. It was gruesomely long and steep. Wheel on to wheel off was 5½ minutes, which seems pretty fast to me. 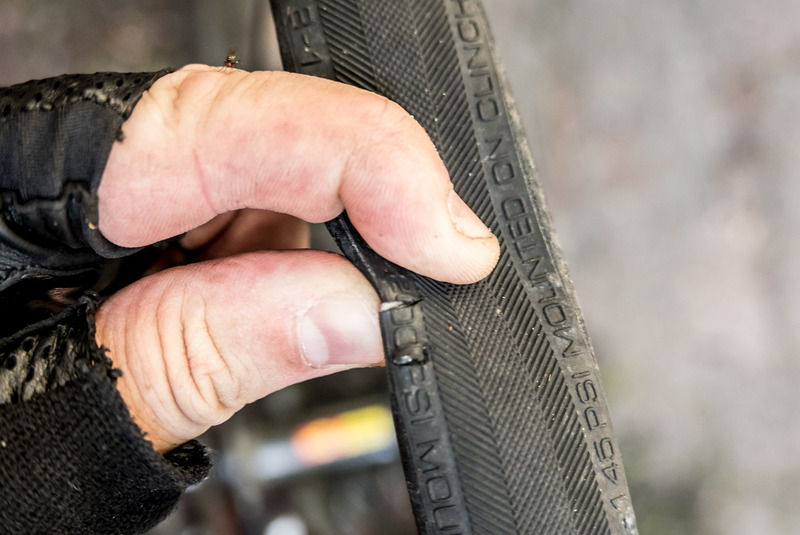 It's apparently possible to change a tube in less than a minute, but in the real world you have to spend the time to investigate why the tube went flat in the first place, to make sure that whatever did it won't just do it again the moment you ride on the new tube. Once on our way, we headed up to Kyomi Pass (京見 峠), a rise of 220m over about 3km (720' over 1.9mi) for an average slope of about 7.3%. Knowing that I had the imposing Momoi Pass looming later in the day, I didn't want to push too hard before that, so for this initial climb I just settled into a pace that felt natural, and somehow ended up making a personal best time of 13:59, breaking the PR that I made last week by 42 seconds. Woohoo! Little natural springs like this are sprinkled throughout the mountains. (We saw a different one here the other day.) It's common to see folks stopping by to fill up big jugs to bring home, as the water is apparently very good, and there's also some kind of religious aspect to it (“sacred water” or the like). Personally, I'm a bit squeamish about drinking water from a tube stuck into the mountain, a tube indistinguishable from the many gutter-runoff drain tubes I see. Michael is likely smiling at Andy's grimacing, which is likely class-clown antics. Everyone likes to put on a show when they crest a pass. This calls to mind “Manseki on the Attack” from last month. 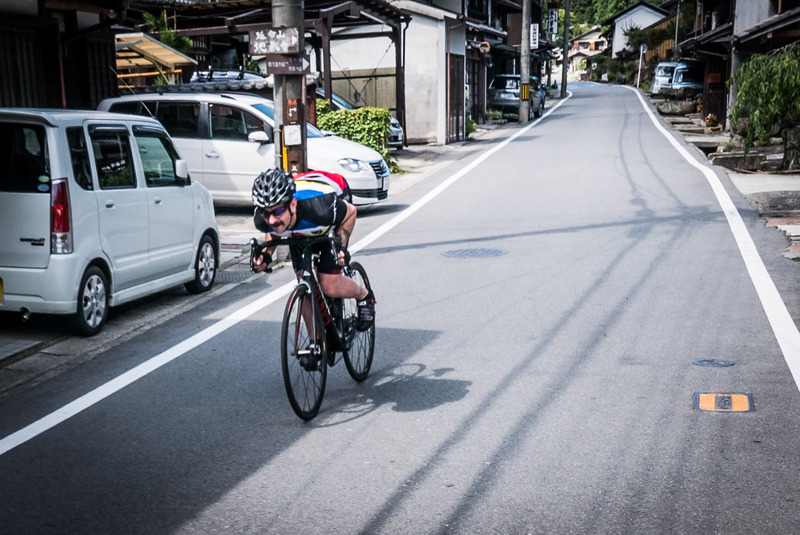 Next we had a long enjoyable downhill, and somewhere along the line Manseki decided that he was going to hit it hard, so he took off like a rocket. Judging from the look on Andy and Michael's faces, they did notice the cute bicycle. This member of the group has a bicycle computer mounted on his bike, so I'm guessing that it's this guy. 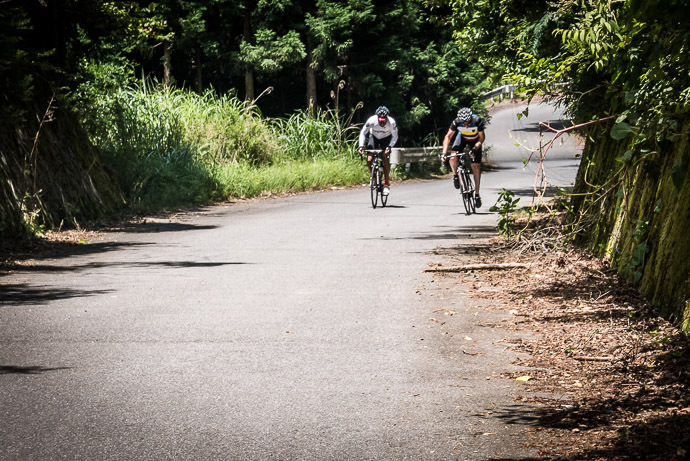 After another 150m of vertical climb over Ebumi Pass (江文峠), we made our way farther north, heading toward the start of the day's big climb, Momoi Pass. Then it was time to reckon with Momoi Pass. The full route is broken into two sections, the first being to an intermediate pass, Maegahata Pass (前ヶ畑峠). That section has 350m of rise over 4.8km (1,150' over 3mi) for an average of 7.3%, but those relatively-mild number belie the true horror of this section. 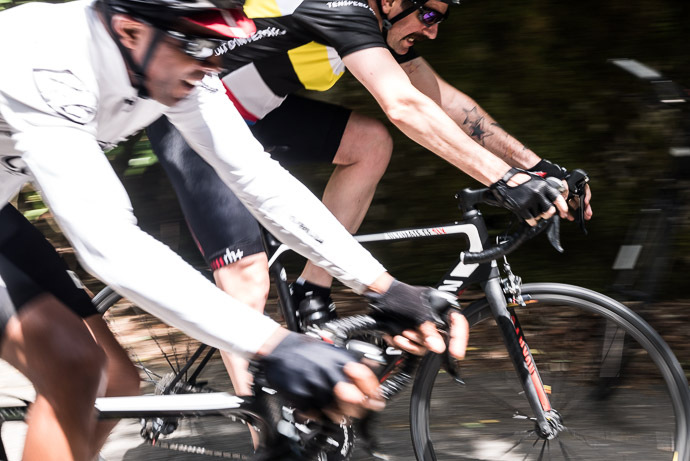 The final mile (1.7km) has an average slope of 12%. This was tough. The road has a bunch of switchbacks snaking up the mountain, and at one particularly sharp curve the road was very wide, so I took the opportunity to try to ride sideways across the road to give me a moment when I wasn't pitched up at a precarious angle, so that I could safely let go of the handlebars with one hand and grab my water bottle. 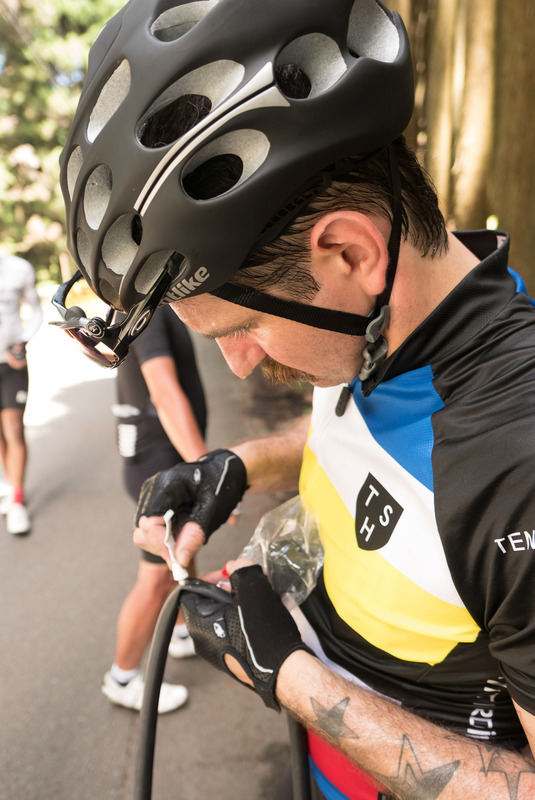 I could grab the bottle, but what I couldn't do was drink; my lungs just couldn't spare the two seconds of oxygen deprivation that a swig of water would entail. I'm not sure what to make of this. 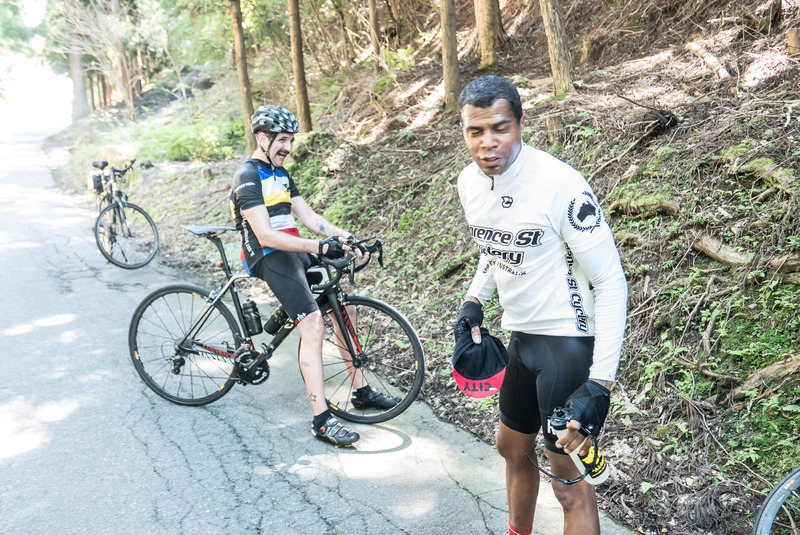 Generally, my heart and my legs are not taxed at all when I ride; it's my lungs that are my limiting factor. I have absolutely huge lung capacity (more than 5L), and I've never run into another cyclist whose lungs are their limiting factor, so I wonder whether my iron might be low. I'll have to have it checked out. Anyway, I made the worst part of the climb in 14:20, which I'm happy to see is not more than double the best time logged on Strava (8:31). 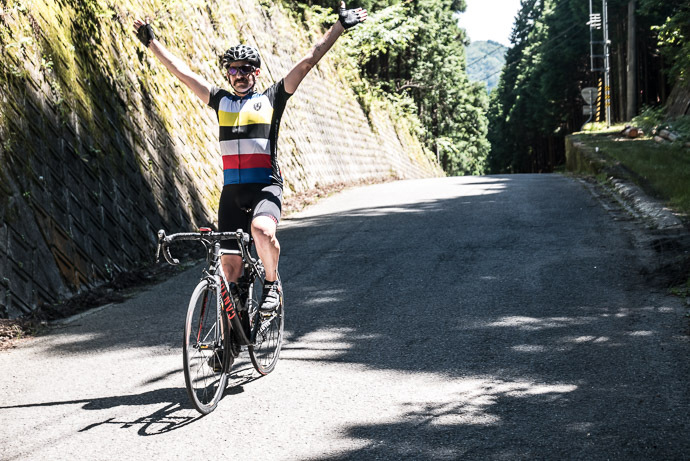 But I must admit defeat because my goal in doing it this first time was not to do it quickly, but to do it without stopping, and without using my easiest front gear (a gear that I would not have if I had a real road bike). But I couldn't do it, so gave up and used the easiest gear, and even then only barely made it without stopping. It didn't help that it was 34℃ (93℉). I'd brought plenty of water (actually “Aquarius” sports drink), but couldn't drink it without stopping and catching my breath, so I did without. Next was Sakura-san, but she looked identical to the shot above (and indeed identical to every shot of her cresting a pass; she's a mountain-killing robot), so no need to repeat the photo here. Then came Michael, who had been kind enough to stop at one of the aforementioned mountain springs to wait for Andy and Mone, and douse them with cool water as they rode by. I feel a little ego boost to be the first to arrive at a pass (okay, a big ego boost), but the reality is that both these guys are far stronger and faster than me, and are merely choosing an easier pace today. For example, last year Andy did the same climb more than two minutes faster than my 47:37 of today. 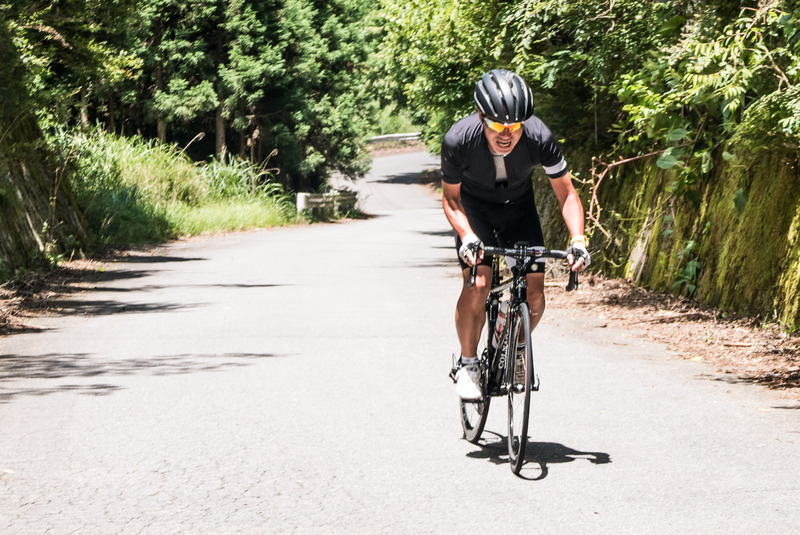 Yet despite both being far faster than me, they're not considered “fast” among the local Cycling Kyoto group, because there are folks who can do this climb in the 28-minute range. That kind of power boggles my mind, yet a pro cyclist could probably do it in 15 minutes. Wow. I don't recall what Andy was laughing at, but Michael had just poured a bottle of water over his own head to cool down, so it was probably related to that. But who knows, Andy had such a fun personality that he doesn't really need a reason to laugh. 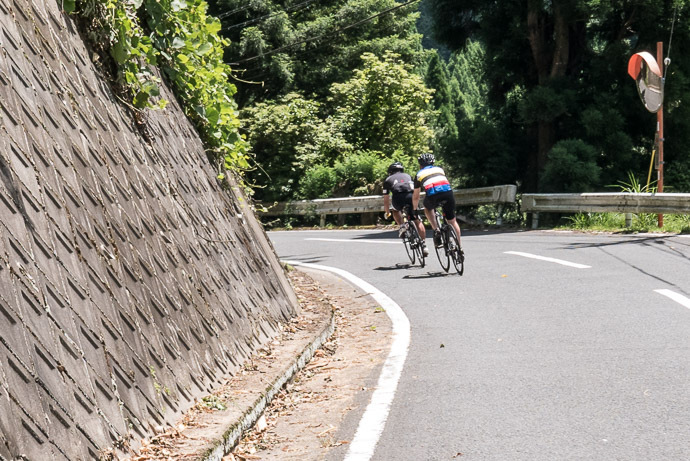 After this the route took us up another 150m (500') to Momoi Pass, but first it descended a bit to a small village, one I recognize every time I pass through as being that of the “Purple Irises in the Mountains” from eight years ago. When I wrote that post I never in a million years would have believed that I'd ride a bicycle out that far. How things have changed. Then on to the real Momoi Pass, which Andy had told me was “just a little push” past the climb we had just done, but it was another mile of 10% grade. I found it easier to do if I tried to pretend that I didn't exist. As noted before, it was hot, but on the plus side, it was again proven how good the Under Armour “Heat Gear” compression shirt is (seen and talked about here). It makes your sweat evaporate quickly, which keeps you cool. Though it was really hot, I felt uncomfortable in only two situations over the course of the whole day: The first was when descending from a pass, where the abundance of built-up sweat from the climb combined with an abundance of speed on the downhill, and I got genuinely chilly, especially going down from Momoi Pass. Let that sink in a bit. It was 34℃ (93℉), and this shirt made me feel chilly. This is why I own stock in the company. 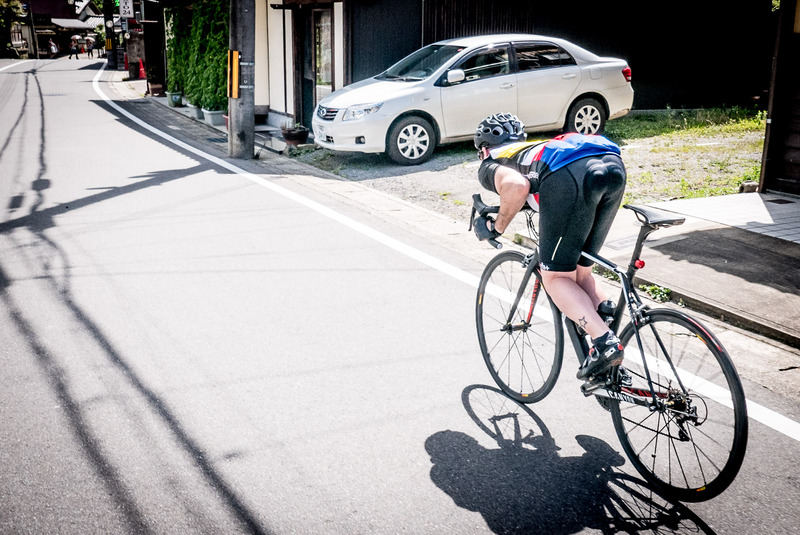 The second time was back in Kyoto just before the end of the ride, after having stopped for coffee with Michael. Returning to the bike in the heat of the day, my shirt had dried and so couldn't do its sweat-evaporating cooling magic, and I was immediately hot and miserable for a few minutes until I moved enough to work up a sweat again. I've extolled the virtues of these garments to folks I ride with, but it's clear no one believes me. Their loss. 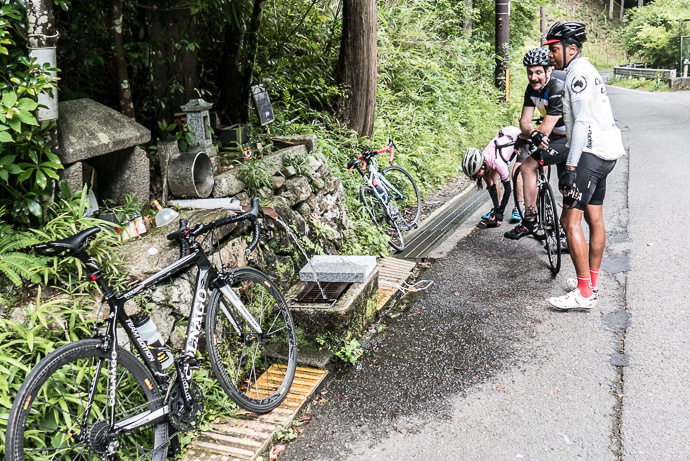 Anyway, back to today's ride, after Momoi we lost track of Sakura-san. 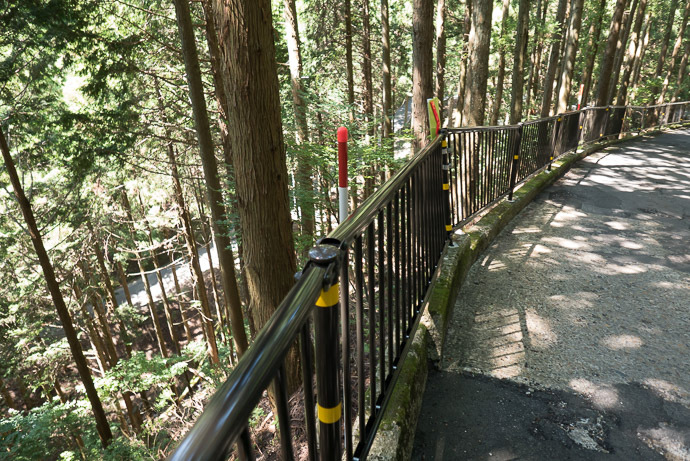 It turns out that instead of returning to Kyoto she'd gone back up the mountain to Hanase Pass, but since there was no phone connectivity, she couldn't message us. But we weren't worried because we know she knows these roads well, having done them with her multiple times in the past. 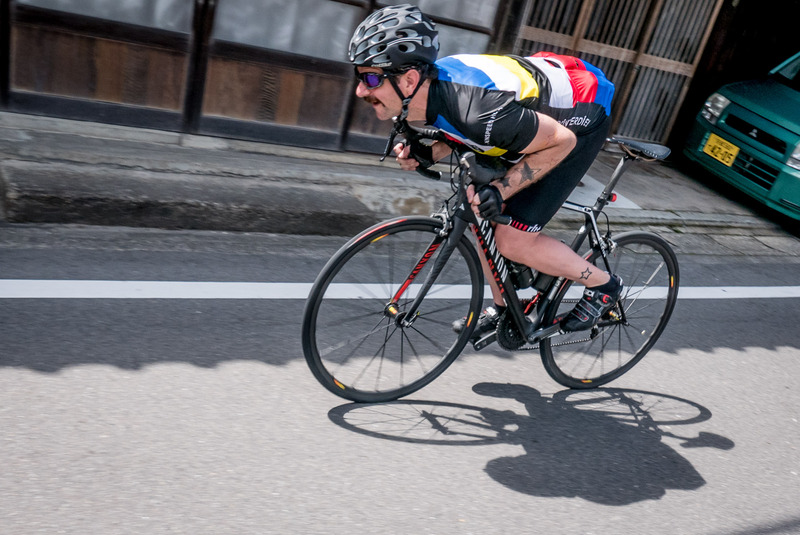 At one point during the long descent from Momoi Pass (which merges into the descent from Hanase Pass), I turned around to take a photo of Andy behind me, and he got into this ridiculously exaggerated “aerodynamic” tuck for the camera. It was a really fun day with good folks, made all the better when I look at the ride data at Strava and see so many new personal records. It's superficial, I know, but it's a big motivating factor. Next Monday is a national holiday in Japan, “Sea Day”, so I'm planning to ride 100km through heavy mountains to the Sea of Japan, to the city of Obama in Fukui Prefecture. The last time I was in this area was 20+ years ago on a motorcycle camping trip when I met the misfortune of a direct hit by a typhoon just as I wanted to settle down for the evening. I'd struggled to set up my tent in gale-force winds, only to give up in defeat and head, soaking wet, into town to find a Japanese inn to stay the night. Anyway, we have a mild typhoon passing by as I write this. Another is out in the Pacific and may arrive here next week, but Monday is looking clear, so here's keeping fingers crossed. What a wonderful blog. Sounds like Kyoto is a really nice place to ride with se pretty cool people. Personally, I’ve been religiously checking Facebook for this post and am thrilled to be featured in your blog. Thanks for the fantastic day in the mountains. I genuinely look forward to riding with you again (soon! ).